We are excited to announce that this year’s Summer Reading Program will include Library Summer Music, sponsored by the Lindsborg Arts Council! Two concerts and two workshops will be presented as part of this series which starts with Thad Beach & The Musical Chair on Saturday, June 2nd at 1:30 PM at the Library. 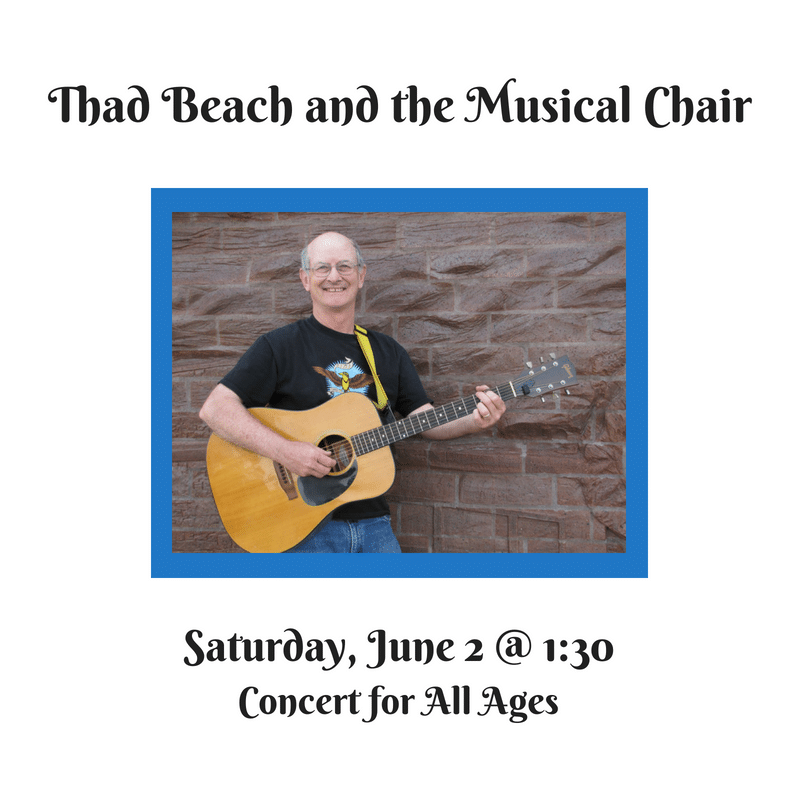 It’s time to “Rock Your Imagination” as musician and songwriter Thad Beach transforms a common wooden chair into a musical accompaniment to his original creations and traditional songs. His concerts provide lots of opportunities to participate and he demonstrates a variety of musical instruments. Thad draws from a diverse background in musical styles ranging from traditional, folk, old-time, and country blues to roaring 20’s. His programs feature a variety of string and percussion instruments. Lots of fun for all ages! In addition to performing, Thad works with children in the schools each year as a teaching artist for preschool through high school, developing and presenting programs on curriculum-related topics. He also devotes time to preserving the history, heritage and cultural aspects of rural areas through song by conducting week-long songwriting residencies for elementary, middle and high schools. Thad grew up in Ohio, has lived both on the coast and in the mountains of North Carolina and is currently at home in Salina, Kansas. He can be reached through his website at ThadBeachMusic.com. This entry was posted in BookBound, Library News, Summer Reading Program on May 30, 2018 by LibraryStaff.